A Cruiser in Grand Theft Auto V.. 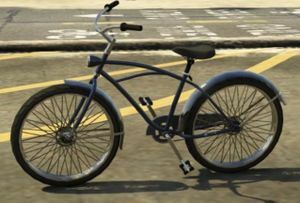 The Cruiser is a bicycle in Grand Theft Auto V sporting a vintage design. It can be bought on www.pandmcycles.com and is the most expensive at $3,000. This page was last modified on 24 November 2013, at 09:54.